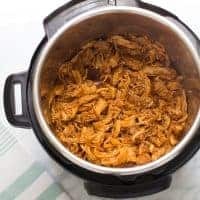 Instant Pot BBQ Chicken! Sweet, fall-apart tender and perfect for sandwiches, salads, BBQ plates and more! Place the chicken thighs, chicken breasts, onion powder, garlic, powder, paprika, salt, BBQ sauce, grated onion, brown sugar and Worcestershire sauce in the instant pot. Stir to combine. Place the lid on the instant pot making sure the valve is in the sealing position. Press manual (high pressure) and set to 15 minutes. Let the pressure naturally release for 10 minutes. Shred and enjoy on sandwiches, salads, BBQ plates and more!